Logistics News: Annual DC Metrics Report Released at WERC Conference; Time for More Focus on Soft Metrics? Logistics News: Annual DC Metrics Report Released at WERC Conference; Time for More Focus on Soft Metrics? Logistics News: Annual DC Metrics Report Released at WERC Conference; Time for More Focus on Soft Metrics? As always, the annual DC metrics report was unveiled at the Warehouse Education and Resources Council (WERC) conference a few weeks ago in Atlanta. With the effort once again led by Dr. Karl Manrodt of Georgia Southern University and Kate Vitasek of consulting firm Supply Chain Visions, the ninth year for the report as always covers a of ground both on what metrics are being used and how companies are performing, but with a bit of a twist this year. In 2012, the authors say that given the general shrinkage in the gap between top and middle level performers, it may be time to increase the focus on "soft" logistics metrics. So as core operational and financial metrics in the DC continued to converge from top to bottom performers, do we need to look at a new set of measures? As usual, the survey respondents represent a broad range of both industry sectors and distribution models (e.g., piece picking versus case picking versus full pallet picking, and combinations thereof). We are always interested in how companies consider their business and supply chain operations. This year, 38.7% said their main focus was customer service; 12% said it was cost leadership (be the low cost provider); and just 9.2% said the focus was on product/market innovation. That left the preponderance of 40.1% to say that the focus was to be "all things to all people," meaning companies are trying to be the best at cost, service and innovation. Whether this is really possible is an open question. The underlying point is that supply chain strategy and execution should be geared to support the overall business strategy. Manrodt and Vitasek say this trend started to be first noticeable in 2007, when "all things to all people" first overtook "customer service" as the top choice for company/supply chain focus. 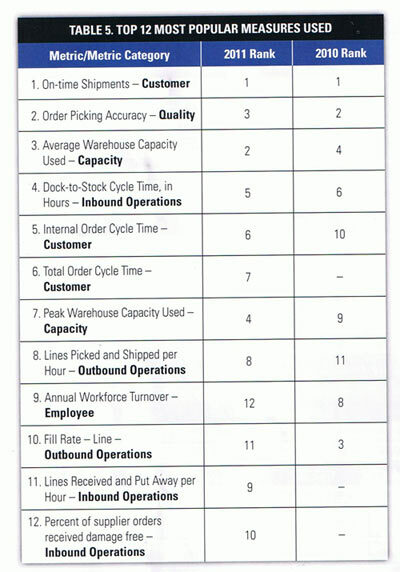 One of the response areas we are most interested in each year is the most popular metrics companies use to measure distribution center performance. There is a surprising amount of churn each year in terms of what metrics make the top 12, based on the percent of respondents reporting scores for what metrics, and the ranking within the top 12. 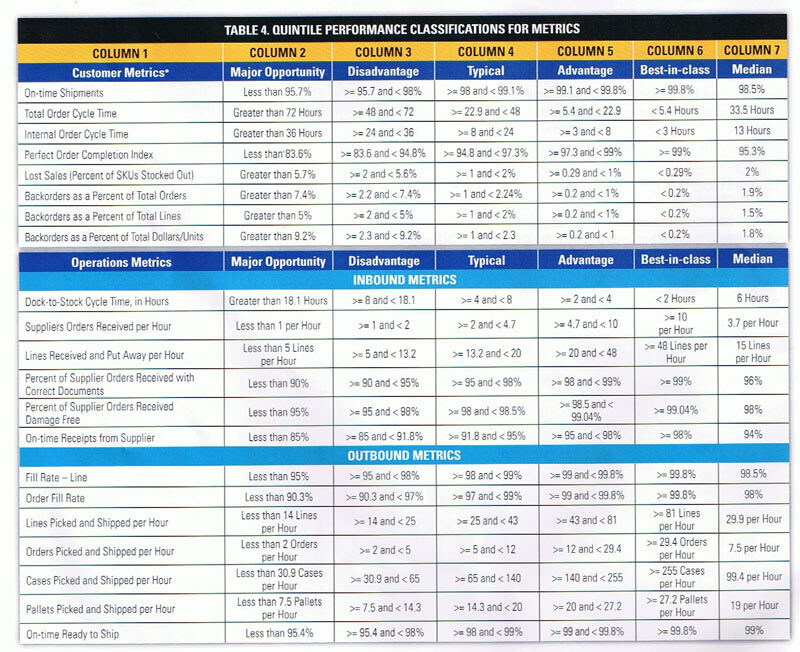 That said, the top 12 DC metrics for this year, and how that compared with the 2011 survey, is shown in the table below. As can be seen, 9 of the top 12 metric for 2012 also made the 2011 list, though there was a bit of shuffling of position (even with on-time shipments staying at the number 1 spot for in both 2011 and 2012). The most dramatic change to us, and what we think must be some form of aberration, is that line fill rates dropped from third highest used metric in 2011 to number 10 this year â€“we believe 2011 was the more accurate position for this commonly used metric. The full report looks at metrics across seven different categories: customer metrics, operational metrics, financial metrics, capacity/quality metrics, employee metrics, perfect order metrics, and cash-to-cash metrics. In this article, we will publish the results for the first two categories, as shown in the graphic below. The results are reported by quintile in terms of performance, ranging from "major opportunity" for the lowest 20% of respondents to the top 20% (best in class), along with the median response for each metric. Should Collapsing Differences in Performances Mean Greater Focus on Soft Metrics? Both at the presentation summarizing the results and the report itself made available immediately after that presentation, Manrodt and Vitasek made the point that the delta between the leaders and middle in terms of performance has been shrinking significantly in recent years. Manrodt and Vitasek say yes, and especially recommend greater use of balanced scorecards that include more formal inclusion of "soft" metrics in addition to "hard" operational measurers. What are soft metrics? Difficult to measure but important attributes such as communications, internal collaboration, innovation and more. As an example, Vitasek noted that Procter & Gamble for many years has been including a metric of P&G's overall "happiness" with the services of real estate firm Jones Lang LaSalle that winds up having a big impact on the compensation firm received from P&G. Not surprisingly, that metric has been going up each quarter for many years in a row. Any reaction to the 2012 DC metrics study? Are you surprised that metrics performance is converging? Should we be looking at greater use of soft metrics? Let us know your thoughts at the Feedback section below.